For a long time I rather arrogantly ignored the string of low budget Westerns produced by A.C. Lyles in the mid/late 1960s as sub par movie fare starring has-been actors and actresses in features no better than what was regularly playing on TV in those days. True, not all of these features are gems; also true that most of the starring roles are filled by veteran performers no longer in their prime or at the peak of their popularity. But right there is the key to what makes these features work to the extent that they do --- which is better than what I used to give them credit for. Now that I am a veteran of many things and also past my prime in numerous ways, I see things a little differently. And Westerns of a quality as seen in the better of the bygone TV shows would be a welcome change on the big or little screen as opposed to much of the crap currently available. In short, I've been watching and enjoying several of these A.C. Lyles Westerns lately and have been left feeling a little guilty about my former dismissal of them. 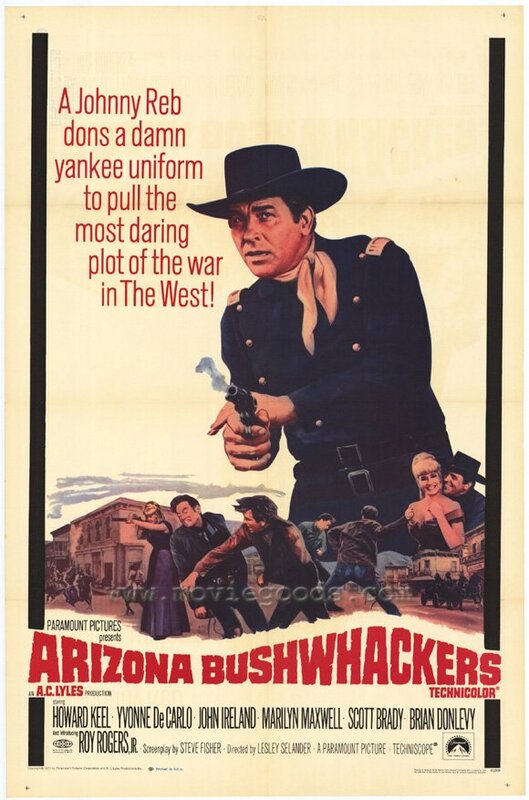 ARIZONA BUSHWHACKERS, despite its rather bland title, is one of the best of what I've seen so far. Starting out with a voiceover narration by James Gagney (uncredited, but it is Jimmy Gagney, a well known friend of Lyles, sure as shootin') it tells the tale of former Confederate officer Lee Travis, now a galvanized Yankee, sent to "clean up" a small, corrupt Arizona town in Indian territory while the war is still going on. In truth, he still has allegiance to the Confederacy and is working undercover to try and secure a cache of much-needed guns and ammo hidden somewhere in the town. It all gets a little corny and a lot complicated with anti-Reb sentiments, double-crosses, good and bad characters not turning out to be what you first thought, and even an Indian raid at the climax. But the actors play it straight and sincere and elevate it higher than the material they have to work with. Howard Keel, in the lead role, does a particularly good job. As does John Ireland. With other veterans like Yvonne DeCarlo, Brian Donlevy, Barton MacLane, Marilyn Maxwell, and Scott Brady backing them up, it's a solid cast brought together in a good old-fashioned shoot-'em-up. If that's what you're in the mood for --- and if you're not, you should be, at least from time to time --- you could do a lot worse. Yvonne DeCarlo. Say no more. Did you mean James Cagney? I saw this movie and thought it was pretty good, but I forget many of the plot twists. Old age, you know.